This is probably the least complex module in the CPU - it contains only combinational logic (see a previous section), and only a few gates per bit. This section shows how a 1-bit multiplexer can be constructed out of basic gates. 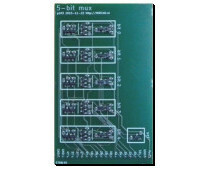 An N-bit multiplexer can be constructed by placing multiple 1-bit multiplexers in parallel. Furthermore, truth-tables are introduced as a convenient way to describe the functional behaviour of gates. As seen from the outside, a 1-bit multiplexer is the same as an N-bit one (shown in the section about the CPU's subsystems), except that its output and both its inputs are only 1 bit wide. There are several ways to construct a 1-bit multiplexer; one such way is to use 3 NAND-gates and an inverter, as shown here. Recall that the NAND-function's output is high, unless both its inputs are high. 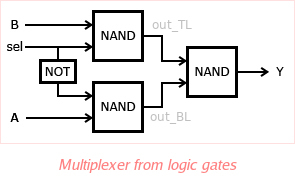 Likewise, for the given 1-bit multiplexer, a similar truth-table exists, in which the outputs of the top-left and bottom-left NAND-gates are named out_TL and out_BL respectively. Or in words: "if sel is low, take A, else take B". This is exactly the desired behaviour. Forming an N-bit multiplexer out of several 1-bit multiplexers is trivial: N 1-bit multiplexers are placed in an array, all sharing a single select-input. All inputs A together form one N-bit input, and all inputs B together form the other N-bit input. All outputs Y together form the N-bit output. Although low in complexity, 2 inputs and 1 output per bit quickly add up, when looking at module pin-count. That's why each multiplexer-module is only 5 bits wide. It's easy to combine several such modules to form a 16-bit multiplexer, needed in the Qibec CPU.